 Dinnerstein (History/Univ. of Arizona), who has written extensively on areas of American Jewish history (Uneasy at Home, not reviewed), offers the first comprehensive scholarly survey of American anti-Semitism, tracing its development from the colonial period to the present. Dinnerstein shows how at the heart of most anti-Semitism lies the old European Christian belief that the Jews killed Christ and rejected his teachings. On the other hand, Dinnerstein asserts that from the earliest days of the colonies, the physical openness of the land and the desire to establish new traditions worked to mitigate some of the viciousness of anti-Semitism. Indeed, American anti-Semitism, even at its most virulent, has never approached the violence of its European counterpart. What has obtained, says the author, has been a mixture of ``tolerance, ambivalence and rejection.'' However, as the book points out, when Christian Americans faced an economic, political, or social crisis, it was usually the Jews who became scapegoats. Major outbursts of anti- Semitic feeling occurred during the Civil War, the depressions of 1873 and 1893, WW I, the Red Scare of 1919, the Great Depression, and WW II, with blame for these upheavals falling on alleged conspiracies of Jewish bankers and media moguls or on filthy foreigners. After WW II, a sudden downswing in anti-Semitism occurred, one that has for the most part continued up to the present, with overtly anti-Jewish behavior and expression at an all-time low in the past decade. 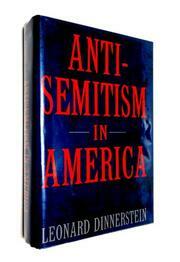 Still, Dinnerstein readily admits, anti-Semitism may have faded to a negligible factor in American political life, but it cannot be eradicated completely, and as his chapter on African-American anti-Semitism notes, it remains a forceful and occasionally fashionable sentiment in some communities. Dinnerstein's book is indeed comprehensive, but it is also rather dry. A useful work, but not for casual reading.